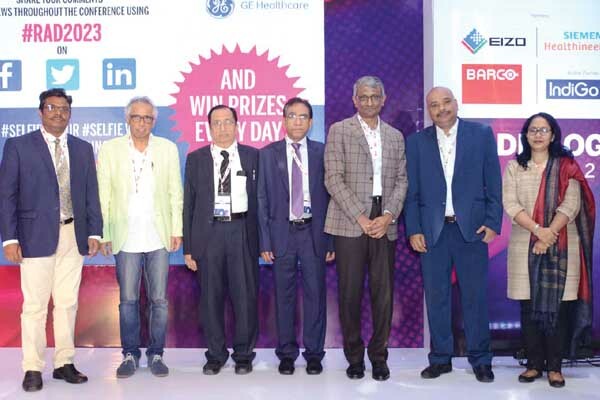 Radiology and Imaging Conclave, India’s specialised gathering of the best minds in radiology, in its first edition witnessed interesting dialogues, debates and deliberations by top radiologists, innovation heads and thought leaders on the future of radiology. The conclave organised by Express Healthcare and Radiology Education Foundation was held on the sidelines of Healthcare Senate 2018. Experts and veterans of the diagnostic sector congregated to discuss on vital trends, innovations and business models shaping the future of radiology in India. These experts also prepared a blueprint for progress based on various skill development activities that will make radiology organisations successful, both in terms of profitability and goodwill. The event commenced with a lamp lighting ceremony followed by the Welcome Address. Viveka Roychowdhury, Editor- Express Healthcare & Express Pharma; Dr Bhavin Jankharia, Chief Radiologist, Picture This by Jankharia, Dr PK Dash Sharma, AERB, Atantra Das Gupta – Director & Head – Health & Medical Equipment, Samsung Healthcare lit the ceremonial lamp and gave an auspicious start to the event. Dr Jankharia in his welcome address explained the vision behind bringing together this august gathering. He highlighted that the future of the radiology as bright, radiologists, industry, innovators and government need to cohesively tap the umpteen opportunities that will enhance radiology services in India for the betterment of patients.